Be a good neighbour. Clear snow and ice from sidewalks as soon as possible after a snowfall to ensure that they are safe for all residents. Lend a hand to those who may not be physically able to shovel. Do not park on the street during a snowstorm while snow clearing operations are underway. Parked cars make plowing difficult, and sometimes impossible. If vehicles are not removed from City streets during plowing, and are found to contravene the by-law, they will be towed. With your help, winter maintenance crews can plow snow faster and more efficiently and you will reduce the chances of having to dig your car out of a snow drift. Keep Children safe - don’t let them play, or build snow forts in the snow banks at the side of road. Snow plows have no place to push the snow except to the curb or shoulder of the road. Sometimes this happens just after you have finished shovelling. We appreciate that this can be frustrating; however, we ask your cooperation in clearing the snow without placing it on the roadway. It is illegal to push snow from your property onto the street. If you hire a private contractor to clear your driveway, make sure the contractor does not push snow into the travelled portion of the roadway, or fill in sidewalks. Pile snow on the right side of your driveway (when facing the road) if possible when shovelling. This helps reduce the amount of snow created by the snow plow at the end of your driveway. Reflective snow markers are available at many local retailers and can be an inexpensive way to help mark the driveway boundary, especially in high traffic areas. Snow markers also help to guide road plows and sidewalk plows during storms and can protect properties from potential damage to the lawn. 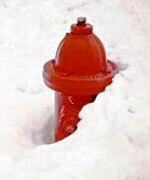 Help prevent street flooding and icing by clearing snow away from storm sewer catch basins near your property. DO NOT place your garbage or recycle boxes on top of snow banks. If possible place them on your driveway near the edge of the road. Sometimes the City receives noise complaints from residents regarding snow plowing operations. Regretfully, there is no way to avoid this problem. Sidewalk and road clearing operations are undertaken day and night in order to quickly and efficiently provide for motorists and pedestrians in accordance with provincial minimum maintenance standards (MMS). Get tips on what you can do if your house has frozen water lines.